To celebrate International Women's Day from the 6th - 10th March 2017 we will be sharing brand new blog content from our authors which explore the themes of 'IWD 2017' and continue the discussion on feminism and women today and through the ages. 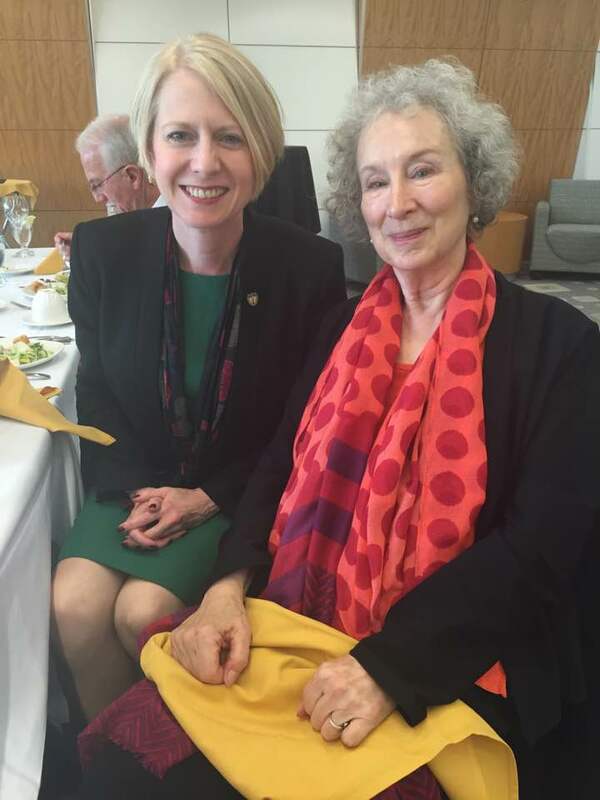 In this blog post Heidi Macpherson, author of The Cambridge Introduction to Margaret Atwood, discusses some of the themes explored in Atwood's work. “She was warned. She was given an explanation. Nevertheless, she persisted.” While these words were used by US Senate Majority Leader Mitch McConnell about Elizabeth Warren during a Senate debate over the nomination of Jeff Sessions to become attorney general, they apply just as well to Margaret Atwood, the world’s greatest living author. She persisted. A prolific poet, novelist and short story writer, Atwood has long been preoccupied with women’s issues during a period when such “issues” keep coming to the fore. Hulu has made an adaptation of Atwood’s most famous book, The Handmaid’s Tale, and I, for one, am eagerly awaiting its release, in the hopes that it will translate from the page to the screen more effectively than an earlier filmed version. Certainly Atwood’s prescient and dystopic novel makes for compelling reading. The College at Brockport was honored to host Atwood on campus this fall as part of our Writers Forum 50th anniversary celebration. Atwood’s novel was our “freshmen read” book this year and offered us an opportunity to introduce students to her captivating book, with its warnings about surveillance and control, the removal of rights and the rise of totalitarian states. While she often asks us difficult questions as readers—what are we doing to the environment? What checks and balances are we offering against scientific progress? Who’s to blame for the state of the world? Just because we can do something, should we? Are we even paying attention?—she is not a writer whose purpose is to lay out a dry dissertation on an ideal world. Instead, she disrupts our expectations and pushes us to consider the perverse, the ridiculous, and the unexpected. Consider her fascination with female bad behaviour, which weaves its way into most of her work. Cat’s Eye’s Cordelia, unlike her Shakespearean namesake, is a mistress of bullying behaviour in a novel that focuses on girls’ destructive cruelty to each other, and Iris, the 80-year-old narrator of The Blind Assassin is deeply unlikeable, equipped with a fierce tongue and a desire to create havoc. Consider Grace in Alias Grace, a celebrated murderess (or is she?) who argues that if the general public wants a monster, she will oblige. Who could forget Zenia, who callously and ruthlessly exposes the weakest spots of her “best friends” and plots to steal their men in The Robber Bride? It is not accidental that in the novel, two small girls go through a phase of requiring all of their storybooks to feature only females: the Big Bad Wolf and three little pigs are made into female characters, whereas the Robber Bridegroom is transformed into a Robber Bride, whose victims are all women. The children “opt for women in every single role” (RB 294). And why not? Atwood suggests that such villainesses “act as keys to doors we need to open, and as mirrors in which we can see more than just a pretty face” (Curious Pursuits 182). She implores women writers to reach for the “spellbinding evil parts for women” and to avoid giving all the “juicy parts” to men (CP 181). Atwood is funny, smart, daring and disruptive. She writes in every possible mode from the short poem to the novel, and she has tried her hand at all known genres, as well as those for which we do not yet have stable names. Though I know from personal experience that she hates the tag The Greatest Living Author, I will assign it to her anyway–because she persisted.